At one time, people prepared for spring and Easter by cleaning and airing out their houses and preparing themselves for the Resurrection; symbolic of starting anew. Many people still do. After the celebration of Fašiangy, the faithful began a period of penance at the beginning of Lent, Sväty Pust. On Ash Wednesday everyone attends Mass and receives ashes from the Priest. He makes a Sign of the Cross on your forehead and says “Remember Man, that you are dust and into dust you shall return. In Slovak churches, on Wednesdays and Fridays, we attended the Stations of the Cross, Krížová Cesta. A cross bearer and two acolytes would accompany the priest as he traveled from station to station. We sang the beautiful Kresťania Sem Pospiechajte or Stala Matka at each station. At the Benediction of the Blessed Sacrament, we sang Na Kolená Padám, and recited the Divine Praises in Slovak. The closing hymn was Pod’akujme Kristu Pánu. Vesper Services, Nešpory, were held at three in the afternoon on every Sunday of the year. The fourth Sunday of Lent was called Latarae Sunday and the vestments were pink. 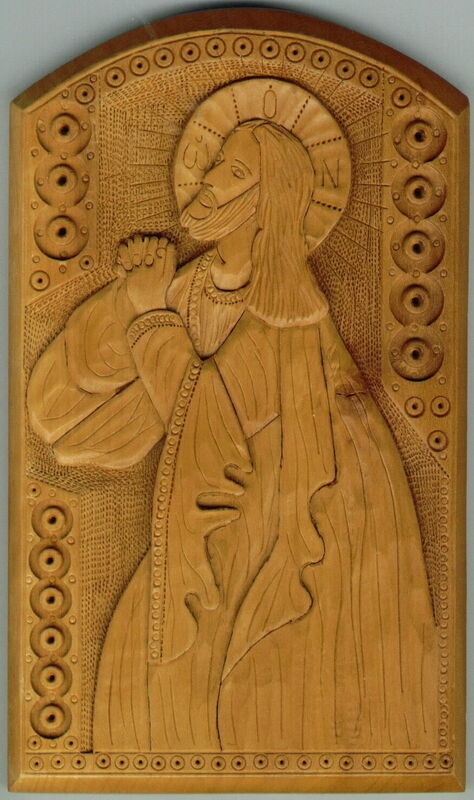 The fifth Sunday in lent was called Passion Sunday, Smrtná Nedeľa. All of the statues were covered with purple cloths and remained covered until Holy Saturday. The title Passion Sunday is now given to the sixth Sunday, which was originally called Palm Sunday. Palm Sunday’s, Kvetná Nedeľa, Mass began with the blessing of palms and then the priest and altar boys would process while we sang Kraľ Neba, Zeme. Members of the choir sang the Passion in Slovak. In Slovakia they used green branches called bahniatka because palms were not always available. We took pussywillows to church that day. The palms were taken home and placed behind the holy pictures or rafters. In the event of a lighting and thunderstorm, some palm was burned in the coal stove. Holy Thursday’s, Zelený Stvrtok, Mass was held in the evening. The Gloria was sung and all of the bells in the church were ringing. After that the organ was silent. The bells would not sound again until Holy Saturday. Wooden clackers were used instead. A procession made around the church with the Blessed Sacrament followed the Mass. The sodality girls and altar boys took part in the procession. The Sacrament was then put in the Repository, which was elaborately decorated. The faithful would make a pilgrimage to three different churches in the area to spend some time praying. “Stay a nd watch with me.” This was the night when Jesus was in the garden praying and was then taken away by the soldiers. Good Friday’s, Veľký Piatok, Services much like todays were different from the ordinary mass. The Passion in Slovak and O ľud Môj Národe Môj were sung. The Cross was venerated and all Crosses were then uncovered. A replica of the grave was displayed. Again the faithful visited the churches. Biela Sobota, Holy Saturday services, which included the blessing of the Pascal candle and the holy water, were usually held in the morning. (In present time the Mass is in the evening.) In the afternoon all of the Easter baskets were blessed. Each basket was covered with a very special embroidered cloth. Some were handed down from generation to generation. The ladies had spent much time preparing the traditional foods, the paska, syrec, pisanky, chren, sunka, kelbosi, etc. The altar boys had a good time collecting decorated eggs from the baskets and of course the children enjoyed the Easter egg hunt. In Slovak churches the wonderful Resurrection Service was celebrated Saturday night. This included a procession. The statues were uncovered, the organ started playing joyously at the Gloria and the bells were ringing. The Sodality girls wore white dresses and veils and carried lilies; the altar boys were in their cassocks. 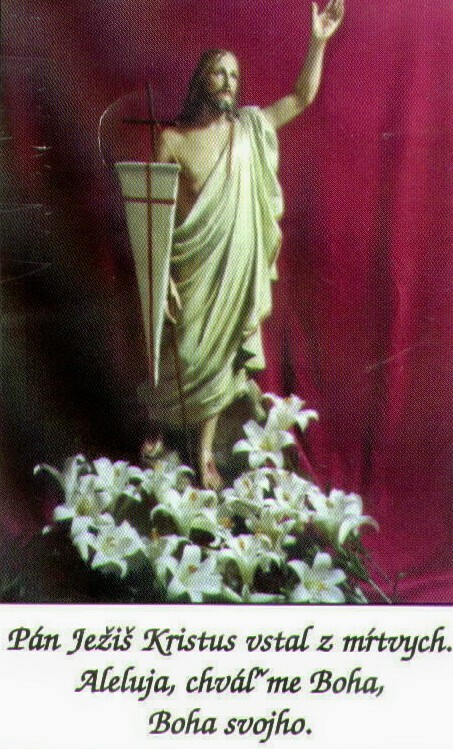 The men of the parish carried a statue of the Risen Christ, the Pascal Candle and a wooden cross with the burial cloth draped showing that Christ was risen. The priest intoned Pan Ježiš Kristus Vstal z Mrtvých. Everyone sang with such joy and fervor that the church just resounded with the lovely voices. The procession then went around the church with the priest carrying the monstrance with the Blessed Sacrament. The incense filled the church. After Benediction, all twenty-eight verses of the beautiful Teba Boha Chavalme were then sung. The Lenten Fast was broken on Easter Sunday morning by eating all of the wonderful food that was blessed. Easter Sunday, Veľká Noc, morning everyone wore their finest and usually new outfits to the Easter Masses. The altars were covered with flowers and candles and the best linens were used. The whole community was filled with rejoicing. What a wonderful greeting for our Savior and the season of spring. Radujte sa, o kresťania! V srdciach vašich plesajte; z mrtvých povstal váš Spasiteľ, alleluja spievajte. Chvála Otcu i Synu, tiež I Duchu Svätému, alleluja, alleluja, radosť tebe hriešnemu.